Gregor McGuckin - The Golden Globe Race. 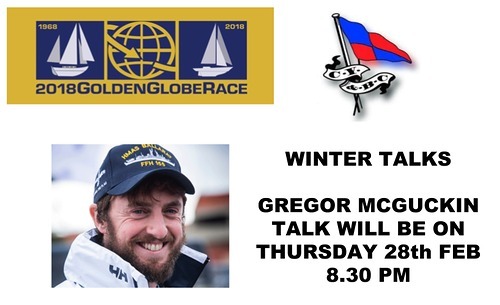 Gregor McGuckin returns to CYBC on Thursday Feb 28th at 8.30 pm to share his experiences of the Golden Globe Race. Gregor was rescued from the Indian Ocean after his yacht was dismasted when he tried to help an injured rival Indian sailor Abhilash Tomy during the Golden Globe Race. The mast of Mr Tomy's yacht Thuriya broke off when it was rolled in a storm, and the yachtsman suffered what he described as a "severe back injury". The 39-year-old Indian navy commander was "incapacitated on his bunk inside his boat" some 1,000 miles south west of Perth in western Australia, "In an incredible show of seamanship, the 32-year-old Irishman managed to build a jury rig and hand steer his yacht Hanley Energy Endurance for the past four days to within 30 miles of his fellow competitor in order to be on site to assist with the rescue if required. However, given the extremely remote location and the condition of his own yacht, Gregor deemed the appropriate course of action to abandon his yacht under a controlled evacuation scenario.